Have you ever been excited by a poster? 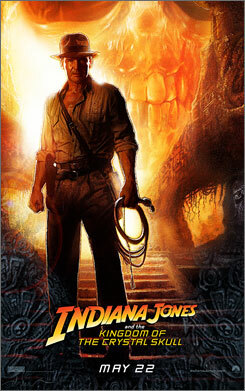 Well I am, with this just released poster for Indiana Jones and the Kingdom of the Crystal Skull! Indy’s looking good indeed and I suppose a teaser trailer is going to come out soon. With 2007 coming to an end and failing to capture my imagination film-wise (save for a few foreign language films and Bee Movie which I have yet to see) I am sure this 4th (and final?) installment of Indiana Jones will more than make up for it come 2008. Wait! I can also hear the John Williams score and I’m a kid all over again.